OpenGL 4.3 specifications have been released yesterday at SIGGRAPH 2012 and NVIDIA gives us the first OpenGL 4.3 capable driver for those who want to play with new OpenGL stuff. OpenGL 4.3 is available on GeForce GTX 400, GTX 500 and GTX 600. You can download the Windows and Linux versions from THIS PAGE. Compared to R304.48, this new driver exposes 34 new extensions for a total of 335 OpenGL extensions (GL=309 and WGL=26). These new extensions are related to OpenGL 4.3 (ARB ones) and to OpenGL ES 3.0 (OES ones). The new GL_KHR_compressed_texture_astc_ldr extension is not yet supported but it should be a matter of time unless the hardware is not ready for ASTC (GL_KHR_compressed_texture_astc_ldr is not part of OpenGL 4.3). 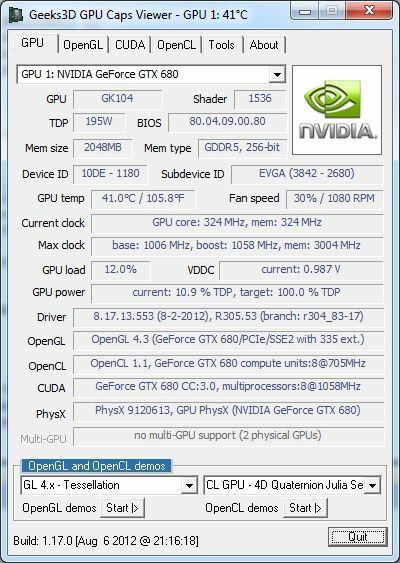 my GTX470 shows 333 OpenGL extensions (307 GL,26 WGL)..
Nvidia has released GeForce 305.67 developer drivers.